The Inn At The Old Silk Mill is located in Historic Downtown Fredericksburg. Built in the 1930's, the Inn was one of the largest motor lodges on the east coast. The Inn reflects a casual elegance enriched with an era gone by. With 27 antique appointed bed and breakfast rooms, all with private baths, the Inn is perfect for romantic getaways, weddings, business retreats, or any other event. 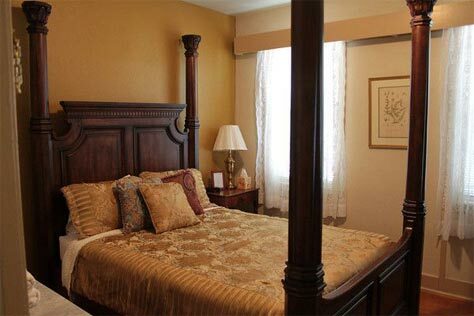 The Inn has 27 antique appointed bed and breakfast rooms all with private baths. The lobby with its grand staircase and chandelier (believed to have once belonged to the George Mason Family) are a perfect welcome and provide a great photo opt for guests. The lobby has a warm fireplace to sit by during winter months and a parlor area with a player piano, coffee, tea and cookies for our guests to enjoy. The Courtyard, located between the Inn and the Mill, is a perfect place to relax during the warmer months. Enjoy a glass of wine or morning coffee and make sure to visit our on site Copper Shop where our local coppersmith, Al Green, hand crafts his popular and patented "Fredericksburg Lantern". A fresh complimentary continental breakfast is served each day. For outdoor seating, the courtyard is directly out the back doors of the Inn, leading to the Silk Mill. The Inn is a perfect place for romantic getaways, girls weekends, family or military reunions, church and business retreats or a small intimate wedding. The Silk Mill was built in 1889 and was a factory that employed over 200 women. The women spun silk that was imported from Italy to go around spools for sewing. Originally the C.W Tholtz Throwing Company, The Mill has been recently renovated to host weddings and events ( including receptions, comedy shows, live music, murder mystery dinner theatre, galas, fundraisers, bridal and other vendor shows). The Silk Mill can accommodate up to 300 guests. The Industrial design of the Mill and the Victorian accents create a unique ambiance for all events. 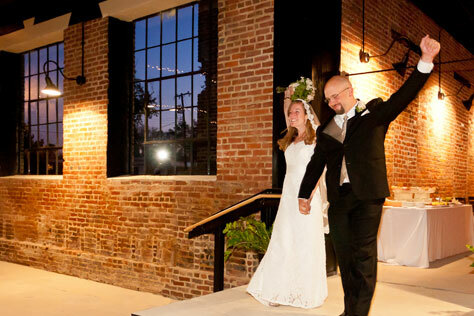 The Inn and Silk Mill are a perfect setting for an all-inclusive wedding. Click here to learn more. The Silk Mill is the gathering spot of our many events throughout the year. Click here to learn more.